Starting his career as a trainee with Leicester City, Paul was a prolific striker and scored some 60 goals for the youth team / reserves. He received his first professional contract with Leicester, and played some 63 games for the Foxes and scoring on 11 occasions. He made several appearances for the England U21’s, scoring 3 goals in 7 caps. In March 1992, he moved to Derby County for a £1.3m fee, which included Phil Gee and Ian Ormondroyd moving in the opposite direction. 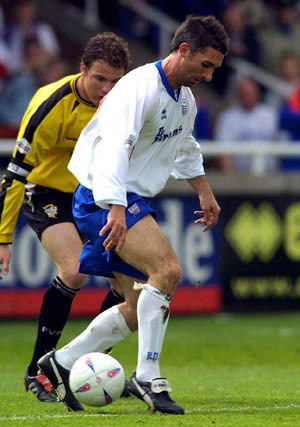 In two and a half years at the Baseball Ground, he scored 49 goals from 132 appearances. In September 1994, Newcastle United made a £2¼m bid for his services, which was eventually accepted. In his 2½ seasons at St.James’ Park, he was behind Andy Cole, Peter Beardsley, Les Ferdinand and Alan Shearer in the pecking order, and only made 36 appearances in the Premier before joining West Ham United for £2.3m in February 1997. He went on to make 63 appearances for the Hammers, and was loaned out to Charlton Athletic and Crystal Palace during the latter part of his stay. 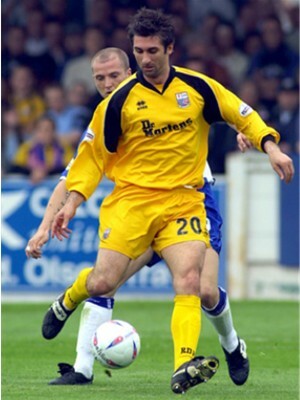 In August 2002, he joined Brighton & Hove Albion, but injury limited the number of games. After a just over a year with the South Coast side, Brian Talbot brought him to Nene Park on 26 September 2003 as cover for Onandi Lowe, who had picked up a groin injury. The initial deal was on non-contract terms, but he was awarded with a formal deal after impressing in his initial stint, including a goal in the memorable victory at Blackpool, and a double in the game against Wrexham at Nene Park. He stayed with the club for the remainder of the 2003 / 2004 season, being released in May 2004 when Diamonds dropped out of Division 2, although he did return to the club for a stint as a striker coach on 4 January 2006 until the end of the season. The stay with the Diamonds was in the twilight of his career and after leaving Diamonds he had a very brief spell with Aldershot Town before retiring.